The world is gearing up for the 2018 Winter Olympics in Pyeongchang, South Korea, which kick off this weekend. In advance of that, it’s worth remembering that New York City was once an aspiring Olympic host. In fact, it wasn’t so long ago that former mayor Michael Bloomberg’s administration was hustling hard to bring the 2012 Summer Olympics to the five boroughs, an honor that eventually went to London. In its quest for Olympic glory, the Bloomberg administration undertook a number of initiatives intended to woo the International Olympic Committee—some of which were successful, and some that weren’t. The Far West Side stadium, the centerpiece of the Olympics campaign (dubbed NYC2012), was scrapped at the last minute, which is one of the factors that ultimately doomed the campaign. But other ideas that were realized drastically changed the city as we know it. The most obvious is the rezoning of Midtown West, allowing for the creation of Hudson Yards, but other major projects (like Long Island City’s Hunters Point South developments) can also trace their roots to the Olympics bid. Here, we look at some of those initiatives, and what happened to them post-NYC2012. While the redevelopment of Manhattan’s far west side had been discussed well before New York became an Olympic contender, the NYC2012 campaign was arguably the catalyst for the 2005 rezoning that led to present-day Hudson Yards. But one major component of the proposal didn’t make it: an 85,000-square-foot stadium that would have become the home of the New York Jets. While the larger Hudson Yards project moved forward, the stadium was left on the cutting-room floor. The West Side Stadium may not have gotten off the ground, but one component of the city’s 2012 Olympics bid eventually came to fruition: the 7 line extension to 34th St–Hudson Yards. The idea had been bandied about before the NYC2012 bid, but once it was tied to the Hudson Yards rezoning, it was all but guaranteed to happen. It didn’t go off without a hitch, however (this is the MTA we’re talking about); the extension was originally supposed to open in 2013, and eventually debuted in 2015. New York’s Olympics bid called for expanding the Javits Center from its original state to a larger, more modern venue, with an additional 340,000 square feet of exhibition space, among other changes. Those plans were scrapped when the Olympics bid fell through, but Governor Andrew Cuomo recently put forth a $1.5 billion redevelopment plan for the convention center. A consortium comprised of LendLease, Turner Construction, and TVS will shepherd the construction of 90,000 square feet of permanent exhibit space, 27 new loading docks, a green roof terrace and pavilion, and a 55,000-square-foot ballroom. When plans for the West Side Stadium were scrapped, the NYC2012 committee had to scramble for a suitable replacement—and they found it in Queens, where the New York Mets had been considering a new stadium for years. As Mitchell Moss outlined in a 2011 report on the Olympics bid, “The New York Mets agreed to build – and pay for – a new stadium, estimated to cost $600 million, next to their existing Shea Stadium in Queens, while the City and State agreed to spend $180 million on infrastructure improvements and site preparation. To help reduce the cost of the stadium, the City granted the Mets the right to construct it on City-owned property, foregoing payment for the land.” The City Council approved Citi Field in 2006—after NYC lost the Olympics bid—and it opened in 2009. Speaking of stadiums: the NYC2012 bid called for some events, including gymnastics, to be held at what would eventually become the Barclays Center in Brooklyn (this is back when it was still the Atlantic Yards stadium, official name TBD). But some, including frequent AY critic Norman Oder, question how much the Olympic bid had to do with the stadium’s ultimate success; “that had nothing to do with the Olympics plan, it was because Bruce Ratner wanted to build a project and saw that he could use basketball to leverage control of land and gain city and state support,” he wrote in a 2011 postexamining Moss’s NYC2012 summary. This Harlem armory dates back to the early 20th century, and in New York’s 2012 Olympics bid, it would have been repurposed as a facility for boxing matches. In 2016, Governor Cuomo announced that a $2.2 million renovation of the building had replaced part of its facade, including large eagles on either side of the entrance. If the Olympics had actually come to New York in 2012, competitors would have been staying in a so-called “Olympic Village” to be constructed in an area that the Bloomberg administration called “Queens West”—today, it’s better known as Hunters Point South. Five architects, including Morphosis and Zaha Hadid Architects (! ), pitched master plans for the waterfront site, but when the Olympics bid went away, so too did those proposals. SHoP eventually ended up designing the two buildings that have since opened, which brought hundreds of apartments to the underutilized area; the second phase, developed by TF Cornerstone, is now underway. 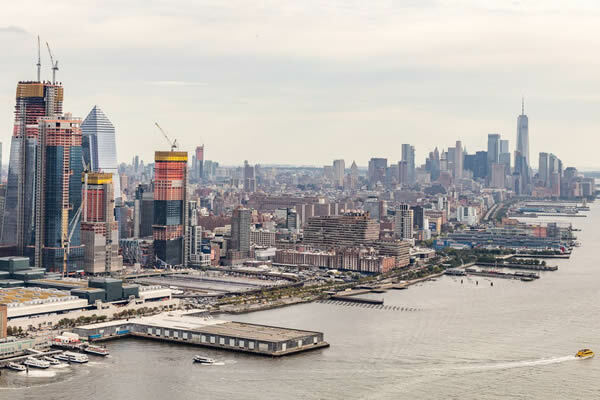 The rezoning of the Williamsburg and Greenpoint waterfront was in the works before the city’s Olympics bid, but the NYC2012 campaign sped the process along. A proposed waterfront park at Bushwick Inlet included in the rezoning—which the Bloomberg administration included as a response to community concerns—would have been used for water sports, as well as beach volleyball. But after the bid was rejected in 2005, progress on the green space, now known as Bushwick Inlet Park, stalled. It was only in the past couple of years that the city has rededicated itself to pushing the promised parkland forward. There was never supposed to be a sports venue where the High Line now stands, but the creation of the High Line and the rezoning of Manhattan’s far west side (and, by extension, the proposed west side stadium) became inextricably linked. As Moss’s report for NYU explains, “the decisive impetus for saving the High Line came when the City Council leadership agreed to support NYC2012’s plan for a West Side Stadium in return for the Bloomberg Administration’s commitment to maintain the High Line.” Now, 13 years post-rezoning, it’s one of the city’s most popular tourist attractions. The South Bronx would have gotten a few Olympics facilities had the NYC2012 campaign been successful, including a new velodrome that would have been used for track cycling. But in the absence of a catalyst like the Olympics, the area now known as the Bronx Terminal Market was instead transformed into a mixed-use development, with a large shopping center that has box stores like Target, Best Buy, and Bed Bath & Beyond as its anchors. As Moss explains in his report on the Olympics bid, “Virtually all venues were located on two intersecting axes that could form an ‘Olympic X,’ with the two axes crossing at the Olympic Village at Hunters Point, Queens, on the East River waterfront across from the United Nations.” The team behind the NYC2012 campaign proposed a system of private ferries that could take athletes to and from the various sites. But the ferry idea didn’t die: The East River Ferry’s pilot program launched in 2011, and morphed into the current NYC Ferry, which is now enjoying unprecedented success.